Select a bottle of wine to enjoy (make sure it's cork-sealed). Place your Coravin System on top and push the needle through. Does it work with synthetic corks? BEST ANSWER: The Coravin Model Two Elite Pro Gift Set should NOT be used on synthetic corks. So far I have had no problems using it on any Cork...Hope this helps! Can this do with champagne? 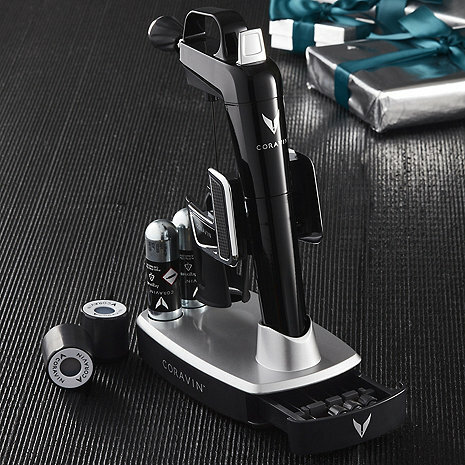 BEST ANSWER: The Coravin Model Two Elite Pro Gift Set does NOT work with Champagne. We do offer the Champagne Preservation Recorker (Chrome), item number 499 31. I bought this system because of my reluctance to drink my good wines. I would run out to the Wine Store to buy a moderately priced wine instead of uncorking one of my many good wines. The Coravin works as advertised. Since purchasing it I have been able to enjoy a glass of 10-year old Barolo, Left Bank Bordeaux, and Napa Cabernet. 1) Sometimes the flow of wine does not allow the Aerator to work properly. I just give it an extra push on the trigger. But in the end I do belief the Aerator is worth it. 2) This set comes with two pedestals (standard pedestal that comes with any Coravin and the Premium pedestal). Both pedestals are very solid and high quality (no cheap plastic here) but quite frankly I prefer the standard pedestal. It is sleeker and less cumbersome. I am not using the premium pedestal at all. 3) I have done at least six five ounce pours and I am still on my first gas capsule. 4) I used the screw caps for the first time last night. Very easy to and worked fine. It will be a while before I see if the wine is preserved as well as the corked wines. 5) I typically do two 5 ounce pours per bottle. After that I will just uncork the bottle. I am pleased with how well the wine has been preserved.